Tashigi’s character design has changed significantly during the series. In her first appearance, she looked like Kuina, but by the battle of Marineford, her design had become more distinct. Tashigi was the second female Marine shown in the series, the retired and deceased Bell-mère being the first. Along with Smoker, Tashigi has appeared in more sagas than any other characters outside the Straw Hat Pirates. In the 4th Japanese Fan Poll, Tashigi was ranked the 42nd most popular character in One Piece. In the 5th Japanese Fan Poll, towards the end of the Dressrosa Arc, Tashigi dropped to 64th place, sharing the spot with Emporio Ivankov. 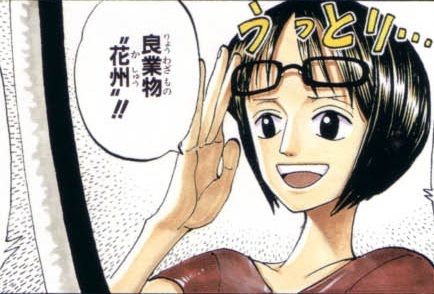 A fan once inquired about Tashigi’s glasses, as she seems nearsighted but lifts her glasses to look closely at a sword and was seen running without glasses. The reader asked if the glasses were for show. Oda stated that she does need them. In Japan, the act of taking another’s sword is seen as a strong statement that implies the wielder was not worthy of the blade, and Tashigi is doing this by taking the blades from criminals. So far, Yamaoroshi and Kashu are the only swords known to have been taken from their previous owners by Tashigi. Next: Why is Sanji addressing Nami with “San” and Robin with “Chan”?